Hi, I'm trying to help a friend recover her data. The disk is 1TB in size and HFS+ formatted. I managed with photorec to recover probably most of the data, but it will of course be a mess to sort everything out. Not a huge problem but I am wondering if there's an easier/testdisk way which I may have missed to just recover the partition with directories etc. dr-xr-xr-t 1 root root    2 Oct  5  2011 .HFS+ Private Directory Data? drwxrwxr-x 1   99   99    9 Oct  5  2011 .
drwxr-xr-x 5 root root 4.0K Jan 11 18:04 .. However, unfortunately it seems there is nothing there. Upon deeper search testdisk also seems to show a load of other disks.. I'm not sure what they all are. 1) Is my method correct? Would it have shown the data if the parition/journal was not corrupted? 2) Would those other partitions offer any hope? 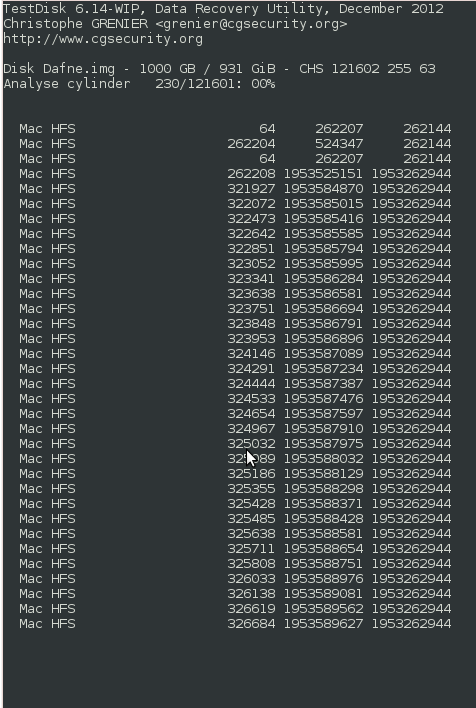 Personally I don't see much point in going trough all of them, they seem more like a sign of some scattered/broken partition table. 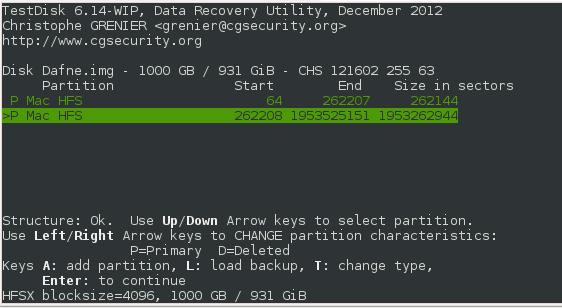 Finally, just a note that someone else has been messing with the disk before me so (s)he might've (re)written partition tables possibly causing this long list of partition tables. Thanks for any suggestions/comments !